ONTARIO – Toronto-based Wesdome Gold Mines says drifting and drilling the 7 zone at the Eagle River mine has resulted in longer than average strike lengths and extended the zone at depth. The underground mine is located about 50 km west of Wawa. The 7 zone is an intermediate zone parallel to the 300 zone to the north and the historic 8 zone to the south. The development work taking place on the 1038-metre level has confirmed that the 7 zone is now over 146 metres along strike and the grade is 30.5 g/t gold uncut over an average true thickness of 2.61 metres. Hole 942-E-65: 33.21 g/t gold uncut (26.10 g/t cut) over 1.56 metre true width. The company has added a fourth underground exploration drill to define and extend the known zones and to determine the eastern extension of the parallel 300 and 7 zones. Two surface drills are turning to intersect these parallel zones closer to the surface. The Eagle River mine has proven and probable reserves of 1.1 million tonnes grading 12.2 g/t gold and containing 416,000 oz. of the yellow metal. 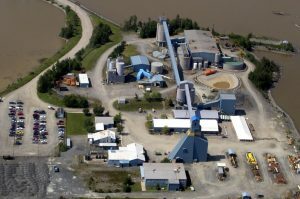 Wesdome is in its 30th year of continuous gold mining in Canada. Please visit www.Wesdome.com.